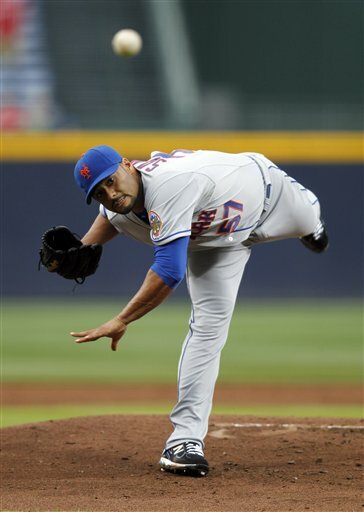 What is Run Support Average and why is Johan Santana’s so high/so low? Was at the game last night and by the end we were talking about how Johan hasn’t had a single run scored for him while on the hill this year. So, I’m looking up through some stats this morning for run support and, according to ESPN, not only is he NOT the least run-supported pitcher in the bigs, he’s not even the least run-supported Santana—which goes to Ervin. Am I just misreading this stat? How people be getting even less run support than the guy who has literally none? In other words, though the Mets have not yet scored a run with Santana on the mound, they’ve scored six total in the four games he has started. He has pitched 18 total innings in those four starts, or two full games’ worth of work. So I guess the stat means to say that if Santana’s Run Support Average is 3.00, the Mets have provided him three runs per nine innings. Only it doesn’t seem to make much sense, since the Mets have scored those runs in (in Santana’s case) twice as many innings as he has actually pitched and, by coincidence, none of the ones in which he was actually pitching. Maybe there’s a logical explanation for calculating it that way — I’m hardly a math guy and my brain’s on short rest. In any case, it’s a silly thing to worry about. Santana’s lack of run support is as well-documented as it is unlikely to continue. It is unfortunate for him that this season he has matched up with Tommy Hanson, Stephen Strasburg and Josh Johnson pitching well in the games he pitched well. Though it seems the “aces match up with aces” thing is mostly overblown, they do necessarily square off at the beginning of the year and, it seems like, often a few times in the first weeks when they’re on similar schedules. But then Santana was near the bottom of the league in Run Support Average in both 2009 and 2010, so maybe this is a real thing. Maybe there’s something about hitting with Johan Santana pitching that makes hitters stop producing runs in those games. Maybe they get too tight or too loose or this lack-of-run-support problem is in their heads. Or maybe this is something we think is a thing that turns out not to be a thing. We’re dealing with 58 total games here for Santana since the start of 2009 — early June if it were playing out in a season — and for most of that span the Mets just haven’t scored many runs at all. Recall that in 2009 and 2010 the Mets were near the bottom of the Majors in runs scored, and consider that several of the other guys who show up near the bottom of that Run Support Average list both years — Zack Greinke, Cliff Lee, Felix Hernandez — seem to be guys who spent at the front of rotations for teams with poor lineups. The 2012 Mets do not appear short on offense, so I’d bet on them starting to score plenty of runs for Santana soon.